For those on the look-out to rent a large holiday cottage near the Yorkshire Dales National Park, you can't go too far wrong with Oakdene near Sedbergh in Cumbria. 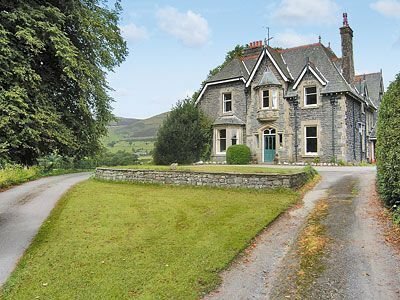 Oakdene sleeps 20 people in 11 bedrooms, so is indeed a very large holiday cottage. In fact, it's so big, I don't think you'd even class Oakdene as a cottage! This property used to be a mill owner's home, and stands with great views out across the countryside. The bedrooms at Oakdene are made up of 4 double bedrooms, 5 twin bedrooms and a couple of single bedrooms - with the bedrooms all being en suite; which means you all get some privacy, and you won't be any queuing for a shower first thing in the morning. One of the living rooms has an open fire; while another living room, and the dining room each has its own wood burning stove. Just imagine a winter short break at Oakdene - enjoying the company of your friends, with the wood burning stoves both throwing out some heat; and the open fire cracking in the hearth. What more could you ask for? You won't freeze if you don't want to attend a real fire though, as gas central heating is also provided. Bed linen and towels are included in the price of your holiday. With modern conveniences such as TVs, DVD players, a washing machine and dish washer are all included too. You have a large garden to explore & enjoy the views; or just to sit on a summer day. There is even a games room with a full size snooker table. Around the area you'll find the restaurant, pub and shop all about &frac23; from Oakdene. And for those with a thirst for outdoor adventure horse riding, sailing, rock climbing and caving are to be found in the area too. As Oakdene is set within the borders of the Yorkshire Dales National Park, this National Park is easy to explore too. Should you fancy seeing the Lake District National Park during your travels, Windermere is an easy drive. Should Oakdene not be to your liking, but you fancy staying in the area around Sedbergh, you might well be interested in the cottages below. All these cottages are within a few miles of Oakdene.